A new survey confirms that Obamacare is most helping some of the very people it was designed to help: blacks, Hispanics and low-income Americans. 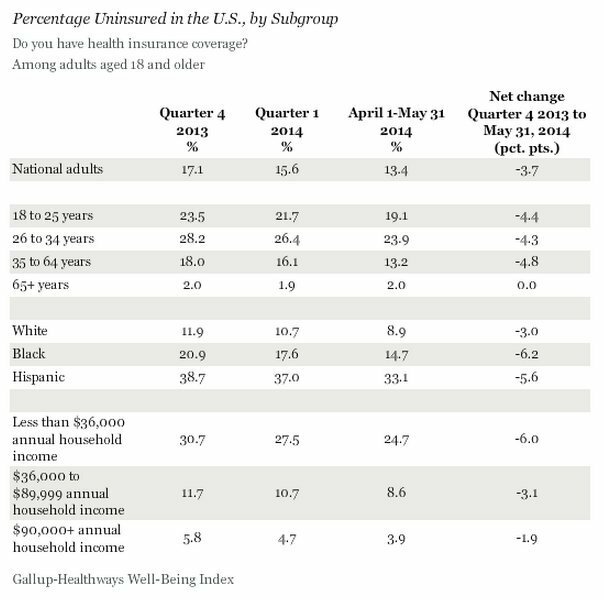 The uninsured rate among blacks has tumbled 6.2 percentage points so far this year, according to a new Gallup poll, based on telephone interviews with 30,430 American adults from April 1 to May 31. The Hispanic uninsured rate fell 5.6 percentage points between the end of the year and the time of the survey. In contrast, the white uninsured rate fell 3 points. The uninsured rate is still higher for blacks and Hispanics than for whites. Even after the rollout of President Barack Obama's health-care reform law and Obamacare's first open-enrollment period, 14.7 percent of blacks and 33.1 percent of Hispanics remain uninsured. Nationally, that rate is 13.4 percent, according to Gallup, down from 17.1 percent at the end of last year. Another notable drop was seen in the uninsured rate for households earning less than $36,000 annually. That percentage fell to 24.7 percent, down 6 points from the end of 2013 -- but still much higher than the national rate. Blacks and Hispanics were a specific target of the Obama administration in its rollout of the health-care law, given their relatively low insurance rates. But amid the fumbled rollout of healthcare.gov, the launch of Obamacare's Spanish-language website was particularly messy. The site's launch was delayed by two months. When it finally opened for business, it was criticized for being "written in Spanglish." The uninsured rate has leveled off since the end of Obamacare's first open-enrollment period. 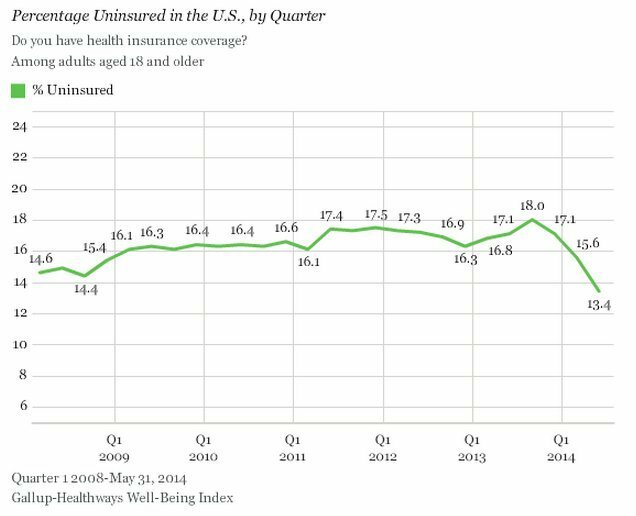 Still, the percentage of Americans who lack insurance is at its lowest since 2008, when Gallup started tracking this data.